I've loved the World Events sculpture (photo) since the first time I saw it in 1996. 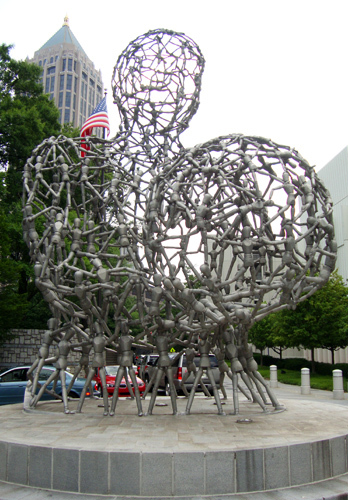 Created by British-born, Royal Academy of Arts-trained sculptor, Tony Cragg, this intriguing sculpture today sits on the grounds of the Woodruff Arts Center just outside the Atlanta Symphony Orchestra. The towering 26-foot tall (not including the base) World Events aluminum bust was commissioned by the Scott Hudgens Family on behalf of the Atlanta Committee for the Olympic Games Cultural Olympiad in association with the 1996 Summer Olympic Games. Originally created for display in Centennial Olympic Park, today, World Events remains one of Atlanta's most recognized sculptures.